This weekend we celebrated a union on Raquette Lake. Our nephew Will was married to Jill in the same picturesque setting that he visited every summer during his youth. Family and friends gathered to share in the big event. 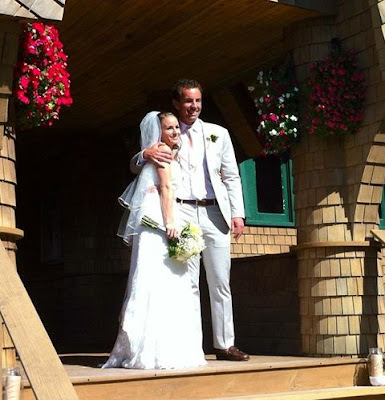 Although Rachel Phinney, (Will's grandmother and my husband's mother), passed away two years ago, there was no denying her presence at this beautiful Adirondack wedding. To all my Phinney family I dedicate the following poem. Did you feel her too? then forced the weather to cooperate? Was it you who safely guided family and friends to the base of West Mountain? was it you who presented a rainbow over Sucker Brook Bay? twinkling from gems of the bride's pink sash? with your arms wrapped around Will? As he bestowed vows to Jill for the taking, was it you who kept his voice strong and from breaking? gently waving from the ferns, leaves, and pine trees tall? gazing down at the small crowd of people? From every smile that warmed this wedding event, was it you radiating hope, good will, and a great time spent? And when Donna and Billy were last on the dance floor, was it you sending best wishes for thirty-seven years more? We all felt your presence, felt you near, felt your love, cascading down sunbeams sent from Heaven above. While reliving fond memories in the chapel's wooden pew, from when I was your son's bride, were you with me, was it you? It was you, Rachel, with us on June 7, 1986. 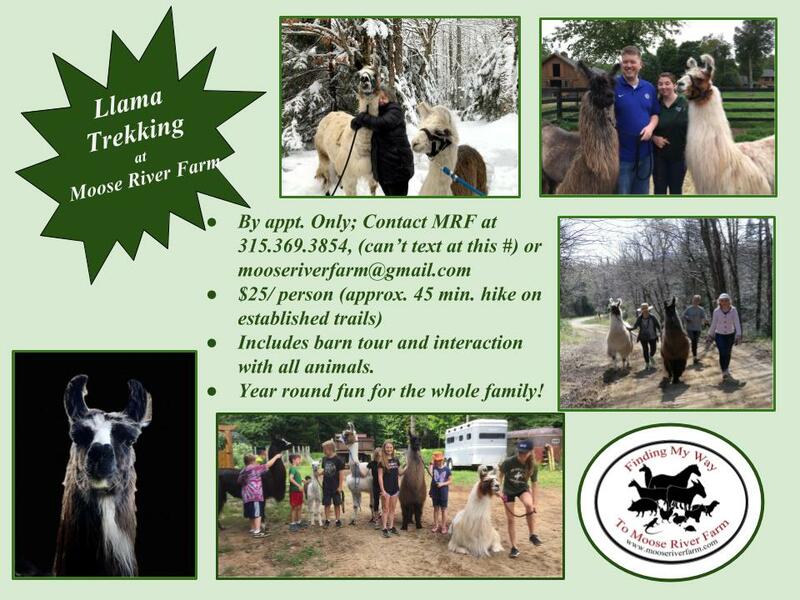 Summer is in full swing at Moose River Farm. The hectic school/barn schedule has been replaced by a slower all-barn-all-the-time routine. And I am loving every minute of it. The day is full of horse related activities. However, there are other animals who catch my attention through subtle communications that insist I wrap my arms around their necks and lavish them with undivided attention. Ah, this wonderful life lived among such fascinating creatures; so much like me and so different at the same time. This is our donkeys' first summer in the Adirondacks. Now that Frankie has been gelded, his aggressive behavior continues to ebb each day. Bing is finally able to relax without his brother pestering every time the mood rises. A donkey day is full of all kinds of adventures explored between long intervals of grazing. Bing and Frankie roam our property freely, choosing where they want to be. The day begins before 7 am after breakfast which consists of two small horse treats. The first order of business after exiting their stall is to roll in the sandy driveway. Donkeys tend to this task with much more exuberance than horses do. They roll over and over, back and forth, preferring to do so in the other's body print left behind in the sand. Its not uncommon for them to pee in the same spot as well, much like two male dogs trying to have the last territorial 'word' before moving off to begin a different activity. Bing and Frankie are never far from the barn. Frequently, they seek shelter in the cool interior of the goat stall. By mid-afternoon quite a crowd is assembled in there including the three goats; all seeking refuge from the sweltering heat and annoying bugs. The whir from a single box fan provides background noise while the little herd patiently waits for evening to descend, bringing relief from the stifling air. The donks keep themselves well hydrated throughout the day by plunging muzzles into the nearest automatic water troughs. Like kids at a drinking fountain, they take turns slurping deeply. Occasionally, they squeeze their mouths into a bowl at the same time, draining all the water before the mechanism has a chance to refill. These cooperative efforts are always a pleasure to witness. Although the donkeys do wrestle and bite each other during periods of play, I have never thought that it was mean spirited. In fact as Frank's 'stud' behavior dissipates, a more considerate demeanor is emerging. Each day that goes by sends memories of demonic Frankie farther into the past. In late afternoon Frankie and Bing return to their stall for horse treats, a belly-filling pile of hay and some much needed rest. "Sweet dreams, little boys, see you in the morning." The following photos provide just a sample of a donkey day full of enrichment and social interactions. Enjoy! Long ears swivel and focus so that a donk can keep track of what's going on. Fiona is in the process of shedding her long winter bristles. 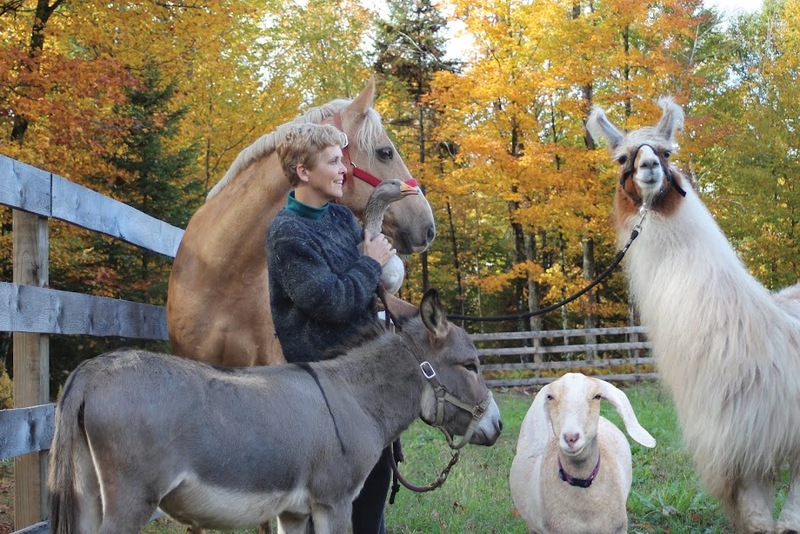 Our new horse, Gatsby, is introduced to Fiona and the donks. "My what big ears you have." Bing and Spirit exchange greetings. May you all enjoy the same peace, adventure and joy of a 'donkey day'. The long Fourth of July weekend is winding down today as tourists pack up their camping gear, motor boats and any souvenirs purchased from the Old Forge Hardware Store. Once they have consolidated these items in or behind a vehicle, they will exit the Adirondack Park with memories to inspire them until they return next year. But those of us lucky enough to call this region home have several more weeks of green piney pleasure to wallow in before the foliage begins to change. I aim to make the most out of every second which will add up to countless hours spent in the barn with my animals. Last week, MRF hummed with a slew of visiting "alumni" and family members including my sister Sue and niece Amy, (All Grown Up). Between scattered rain showers we were able to ride horses through the woods after schooling them in the ring. 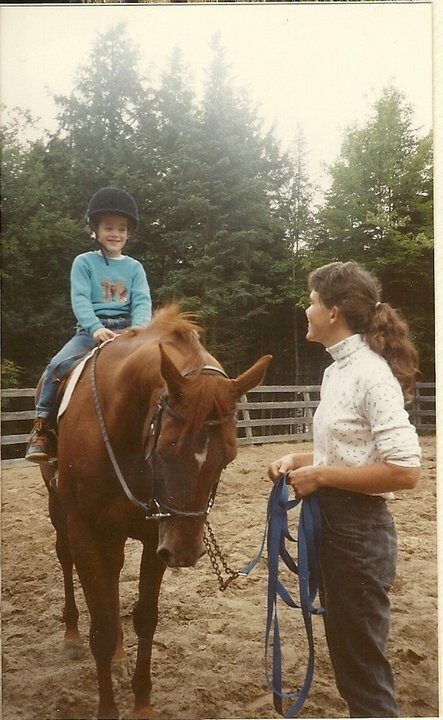 Another niece, Karly, (All Grown Up, Part II), who has spent many of her childhood summer days at MRF, joined us for an equestrian family reunion. 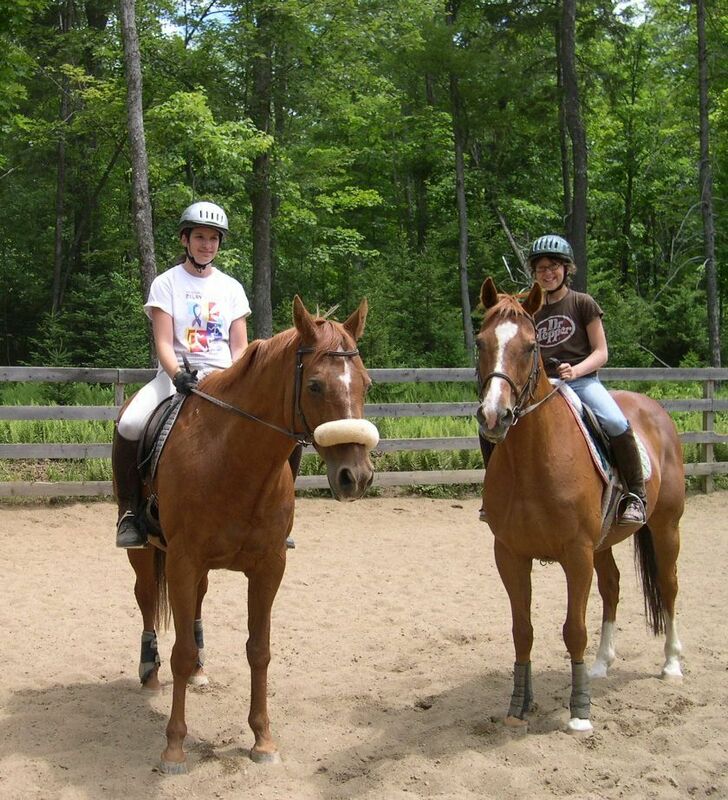 Courtney and Lauren Holt, MRF riders since 2004, (Hoofbeats in the Adirondacks, 2012), joined the fun as well. To top it all off, my dear friend Cindy,(Healing with Horses), visiting from NC, spent a day at the farm too. Each of their lives has lead them along a convoluted path. 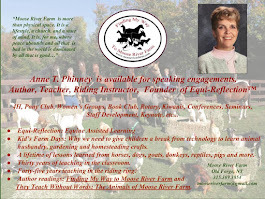 However, its nice to know that every once in awhile they meander back to the barn where we can all spend a little time together in the company of horses. Amy and her mother, my sister, Sue. Summer vacation is off to a wet start with so many chores to accomplish in such a short season. Our yearling donkeys, Frankie and Bing, continue to entertain us with their endearing social interactions. However, lately their playfulness has begun to show signs of aggression towards each other. This change in behavior is not surprising considering that both donks are males on their way to sexual maturity. Unfortunately, for Bing, Frankie got there first. Since Frank is much larger than Bing it is clear that Frankie's surgery can't wait until the other donkey catches up with him some time this fall. We were also hoping to wait until the fly season was behind us. Oh well, if there is one thing that my animals have taught me, it is to remain flexible and open to change. Yesterday, our vet arrived with a summer intern to 'geld' Frankie. The procedure went perfectly! Always a consummate professional and compassionate soul, Dr. Nightingale demonstrated once again how highly trained and knowledgeable she is in her chosen field. 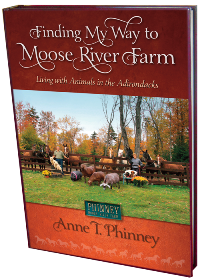 Whether performing routine surgical procedures, injecting yearly vaccines or bringing lasting peace to an aging pet, it is always a pleasure to have her at Moose River Farm. As for Frankie? This morning he greeted me with a beautiful soulful song before plunging his muzzle into a pile of hay. Although a bit sore, he is anxious to reunite with his donkey brother. Meanwhile, Bing is enjoying a quiet morning on his own with the goats. In a month or two, it will be his turn to be gelded. When that time comes Frankie can assure Bing that their aggressive behavior will soon return to playfulness. Frankie tries desperately to fight the effects of the sedative. Bing wonders why his best friend is unable to play at the moment. Dr. Nightingale prepares her patient for the 'kindest cut'. Bing gives Frank one more nudge before being removed from the scene. Dr. Nightingale teaches as she works. The procedure requires many steps. While the front end dozes the vets tend to business at the other end. ...can resume their normal activities!